The Institute has a well organized Placement Cell with its objective to provide assistance and guidance to its participants in getting training and employment in the corporate world. It serves as a channel of communication between participants and organisations seeking skilled human resource. Placement is a facility, not a right. Attempts are made every year to contact more and more organizations for summer training as well as final placement. Efficiency of the Placement Cell is such that in many cases some students have been selected by more than one employer. Consistent with its objectives, the Institute placement support is not confined only to the designated organizations/ employment sector. The Institute has posted the description of each ambitious plan and the curriculum vitae of each of its participants on its website. This will ensure that all the passing out participants have several options in the corporate world for a better future. 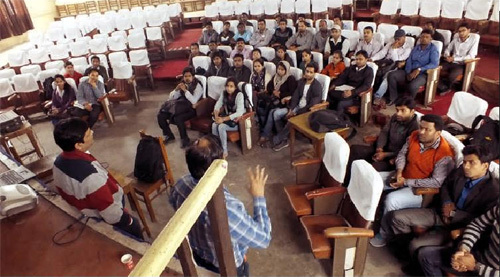 The Institute has been successful in placing its participants in reputed organizations for summer training and final placement. Following are some of the organizations which have participated in the Institute’s summer training and final placement programmes in recent past. A placement brochure is brought out by the Institute with complete and updated information for the benefit of the students. Dena Bank SISONA Infotech Pvt. Ltd.
EPF, Govt.of India Sony India Pvt. Ltd.